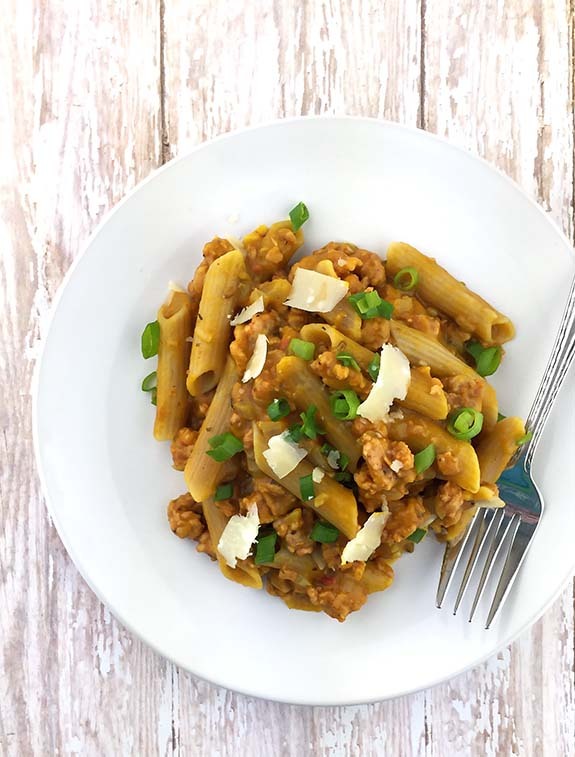 This Italian Sausage and Pumpkin Pasta recipe is not only total comfort food, but it’s also a one-skillet meal. Delicious, simple, and you get to skip washing an extra pot? Woohoo! 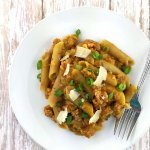 I came up with this recipe for dinner one night last week, and we just fell in love with it at first bite. I literally couldn’t wait to have the leftovers for lunch the next day. Don’t you just love when you have really good leftovers to look forward to at lunchtime? It is so easy to make, and comes together in no time. Now, if you want to go all out and make your own pumpkin puree, that’s fine too. One of my main goals for this blog is to get people cooking more meals at home. If you are tired or just don’t feel like cooking, having a can of pumpkin puree ready to go in your pantry can be a really great thing. It means a tasty dinner can be on your table in about thirty minutes. Steam some broccoli or saute some baby spinach to go alongside and you’ve got a great, healthy meal right there! If you want a really spicy dish, you could use all hot Italian sausage. That’s the way I made it the other night, and it was pretty spicy. I think a balance of sweet and hot would be much better. Or you could just use all sweet Italian, if your family prefers that. Heat 1 tbsp. of olive oil over medium-high heat. Add the sausage to the pan and brown it, breaking it up with a spoon as it cooks. Add the onions and cook until softened, about 5-6 minutes. Stir in the garlic, salt and spices. Pour in water, pumpkin puree and pasta and stir to combine. Bring to a boil, reduce to medium, cover and cook, stirring frequently, until pasta has absorbed the liquid and is tender. Cooking time may vary based on the type of pasta used. Top with scallions and grated parmesan cheese, then serve. Stirring frequently as it cooks is really important in helping to keep it from sticking to the bottom of the pan. If it starts looking a little too thick as it cooks, you can try adding a little bit more water to the pan. If you don't have a spice grinder, you can crush the fennel seeds on your cutting board with your knife. Pour a drop of oil or water on the seeds to keep them from scattering all over the place while you chop them with your knife.